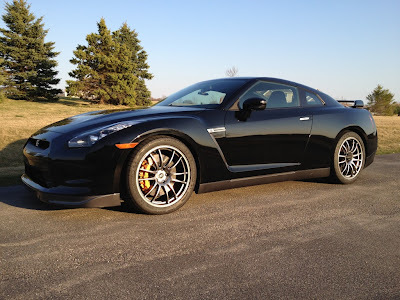 A question that comes up often around the Nissan GT-R community, is the question of wheels and tires. Do I have to use stock tires? What diameter wheels fit over the brakes? Which are best for the street? Which tires are best for the track? 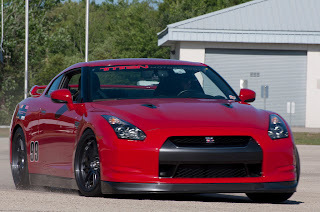 Below is a group of notes that I have gathered both from my own dealings, and from some GT-R owners on NAGTROC. 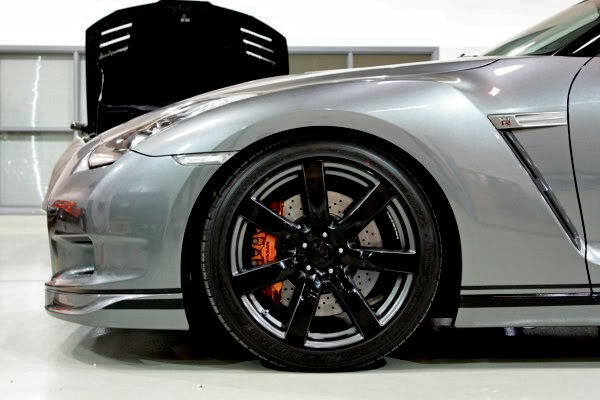 It covers the stock wheel and tires, 18 inch, 19 inch, 20 inch, and even 21 inch wheel and tires for the R35 GTR. I will be adding more pictures of wheels, and fits, and new information as I get it. There have been some reports that the offsets were different in some of the years, however this isn't true. 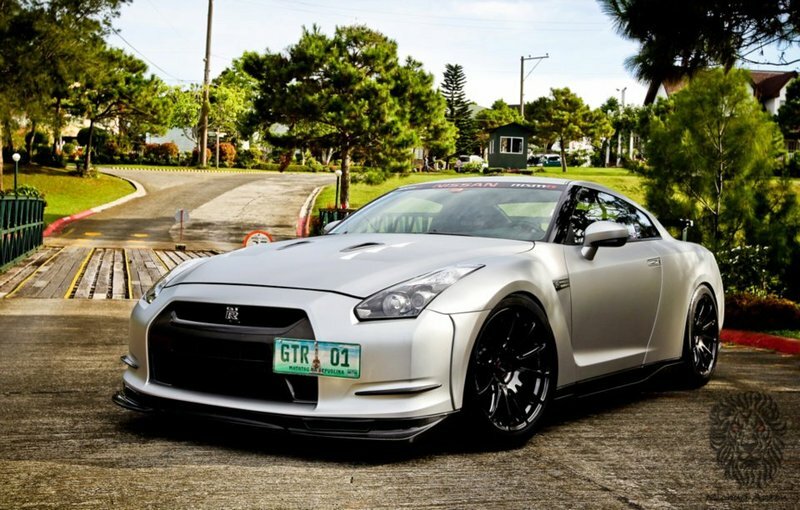 There may have been a misprint in some of Nissan's press materials on the GTR. 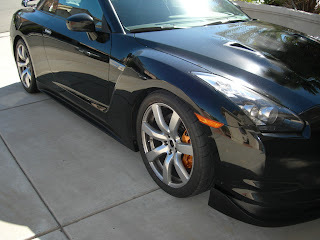 From 2009-2011 in the US the Nissan GT-R wheels were the same style 7 spoke, for 2012 there are two wheels. 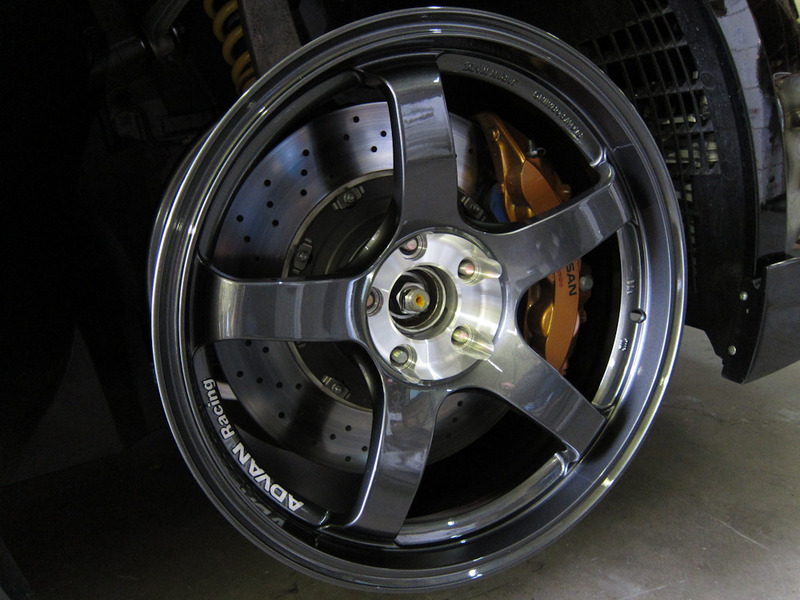 The standard Premium wheel, and the Black Edition wheel. 18" Enkei GTC-01 for the track, which are much cheaper then the rays or ccw's (i would only run 18's for the track through, and to and from the track). The Enkei rims are 18x10" - they only make these with a 22mm offset, which is not ideal, but works fine. 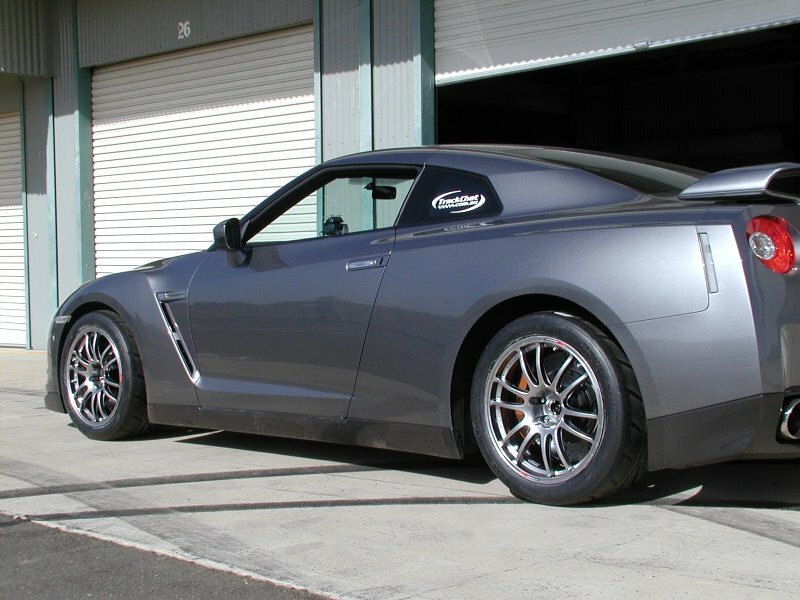 If you want to run R compounds and keep tire costs down, just run Nitto NT-01's in 275/40/18 size on some Enkei GTC-01 wheels in 18x10-22mm offset size. Tires can be had for $275 each or so with free shipping. 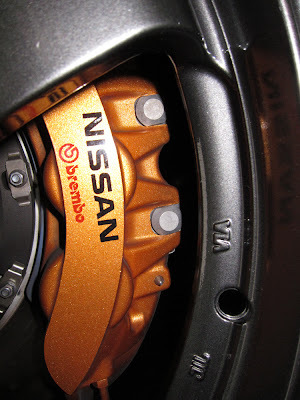 Works great for me, and you can just move the wheels and tires around for wear equalization, and flip them on the rims if you have to, but I haven't found that to be necessary on my car. You can carry all four wheels in the car to the track events. One in each of the 3 seats and one in the trunk, with room for jack and other gear. Here you can see what +22 and 18x10 looks like with stock suspension. wheel is about 33mm farther outside the wheel well vs OEM fronts. If you use 18x10.5 with +38mm offset then it would be 17mm farther out vs with +15mm offset about +40mm farther outside or almost the same as this picture. 18x10.5 +38mm offset has backspace of 7.2" or 184mm or about 6mm deeper insider the wheel well- should fit OK, sticks outward 0.7" or 17mm vs OEM fronts. So for inside clearance on the 18x10.5 with +15mm offset it is about the same as what I am running now in 18x10 +22mm offset. Wider 315mm tires should be OK. I think if you started with 18x10.5 +38mm offset on the fronts you could always add 10mm spacers later. If you used 18x10.5 with +15mm offset front and back it would work but you have to do the test fitment to make sure it cleared everything and you'd have about 315mm tires as the limit due to clearance in the fronts. 305mm would be no problem. Bridgestone RE55 are more of a competition club racing tire.It's better for circuit racing: Time Attack, Sports Driving, or endurance track racing.For the largest size it comes in the tire only comes in a hard compound Type SR2 and is not for any wet use.It is asymmetic unidirectional left vs right tread, treadwear about 40. 295/30-18 $277 each, fits rims 10-11" wide, tire diameter 25.1"
315/30-18 $310 each, fits rims 10.5-11.5" wide, tire diameter 25.5"
305/30-18 $347 each, tire diameter 25.3"
315/35-18 $336 each, tire diameter 26.4"
295/30-18 $338 each, fits rims 9.5-11" wide, tire diameter 25.3"
315/30-18 $348 each, fits rims 11-12" wide, tire diameter 25.6"
The only thing that connects your Nissan GT-R to the road are the four contact patches of the tires. It is these contact patches, which allow you to turn, stop, and accelerate. A tire can only give you 100% of its capacity before it starts to slip. It can slip on low traction, it can slip on oil. Slip on…. 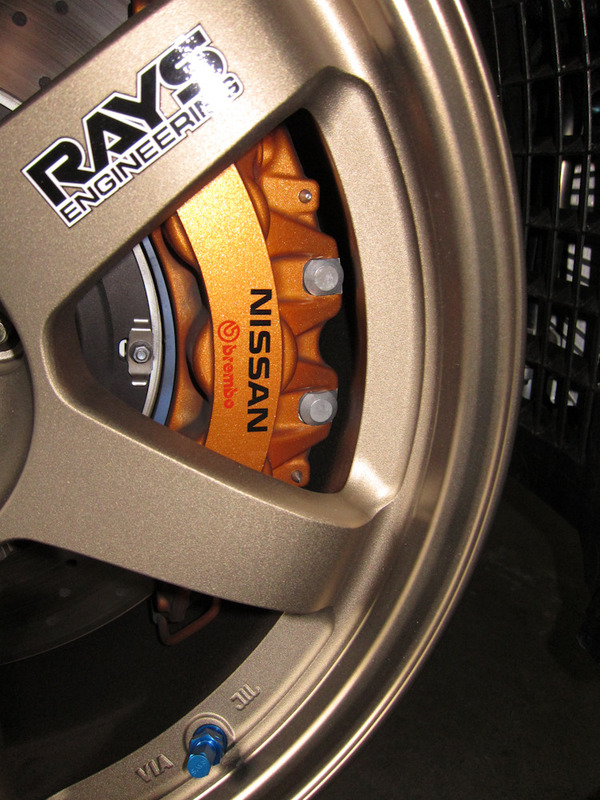 C10 18x10.5 for GT-R is 27mm offset. That's as far in as you can go without rubbing the suspension arm with the inner part of the wheel. 18 X 10.5" front wheels fit within the fenders. What seems to be the best fit is the 18 X 10 GTC01 22mm Offsett and no spacer. I'll just have to squeeze the 315/18 on those for the front. I did try PF01 18 X 10.5 with 38mm offset & 15mm Spacers, as well as PF01 18 X 10.5 15mm offset and no spacers. The 38mm with spacers stick out about 1/4" more than the GTC01 wheels, and the 15mm offset stick out about a 1/2" more than the GTC01 wheels. On the back... I tried both the 38mm and the 15mm 18 X 10.5 PF01's... and I like the 38mm (tucked in a bit) vs. the 15mm which stuck out a bit. The 315's will fit a bit better on the 10.5's in the back as well, and I'm thinking the slightly wider front track should help the car turn. So... looks like I'm going to try running 315's on all four corners... with the fronts on 18X10's... and a 22mm offset, and the rears on 18 X 10.5's with a 38mm offsett. 18x10.5 +15 PF01 with 315/35/18 Kumho V710 all around. rolled fender dropped 1.5" 2-3 degree more camber = no rub at track. 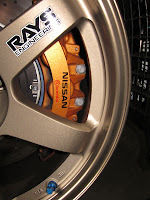 The 2012 Nissan GT-R has a 390mm front rotor. 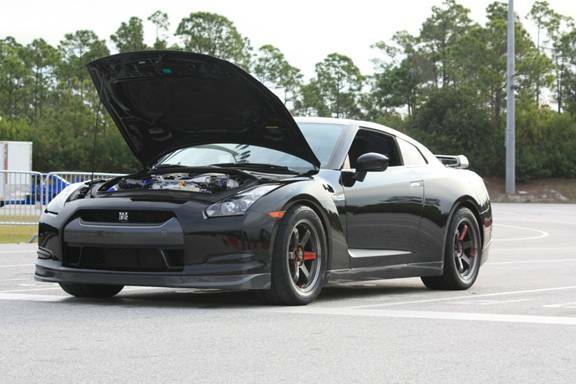 Chaz from NAGTROC took his GT-R over to Mackin and test fit several wheels on his DBA. Some photos below. 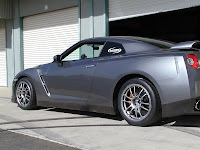 The two wheels we tested for clearance were Volk TE37s 18x9.5 +22 and Advan TCIIIs 18x10 +35. 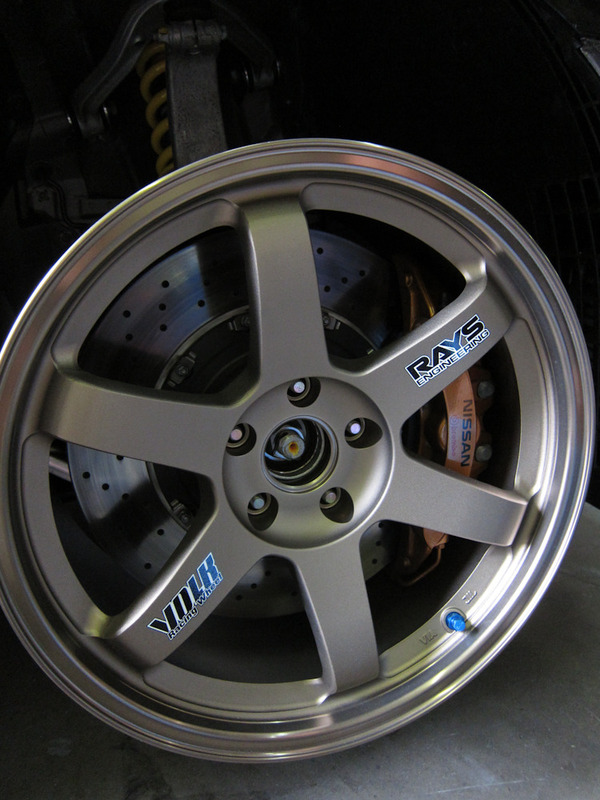 Both wheels cleared the calipers with about 3mm's worth on the TEs and 5mm's worth on the TCIIIs. The only thing you'd have to do to mount these is to make sure when you balance the wheel the weights are placed in the back or at least away from the calipers. 19 inch wheels again open up a few more tire choices, but not as many as a 18" tire. Probably the most irritating thing about 19" wheels is that it throws off the speedometer off by @8-9%. This also means the odometer is ticking off miles 8-9% faster than it should be. On the new set coming my way, I decided to do the same as Forged Performance by going 295/30 19 in front and 305/30 19 in rear. The 305s are a 102Y rating and will give me a little more rubber... but at a cost (the 305s are $90/tire more expensive). 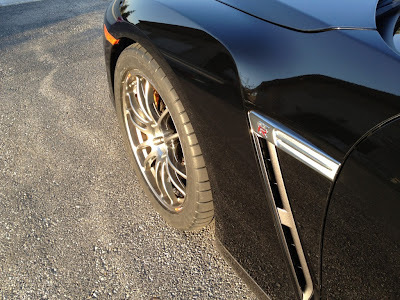 Closest, without going over would be the P295/35ZR19 - 27.2 inches tall. They also have a 315/40/19 which is 28.9 tall, but you might have some clearance issues. Tiresdirect.net still shows some 305/30-19s in stock (limited availability) at $379/tire. 19 inch wheel and tire thread. Georges' autocross GT-R. I think these are a 19" RE30 with a 305 square setup. It looks like a lot of rubber, and not only that red is faster. 43860 305/30R18 NARRA 11.6" 25.6" 80.5" 11-12" 11" 12.5"
46830 P255/40ZR18 9.8" 26.2" 82.1" 8.5-10.0" 9.0" 10.6"
46832 P255/35ZR18 10.3" 24.8" 77.8" 8.5-10.0" 9.0" 10.8"
46836 P275/35ZR18 10.3" 25.5" 80.2" 9-11" 9.5" 10.7"
46840 P285/30ZR18 10.9" 24.9" 78.1" 10-11" 10.0" 11.5"
46843 P295/30ZR18 10.8" 25.3" 79.5" 9.5-11" 10.0" 11.6"
46846 P315/30ZR18 11.8" 25.6" 80.5" 11-12" 11.0" 12.5"
Stock offset is 9.5 + 45 in the front. So the 11 is 1.5 inches wider or 25.4 mm x 1.5 inches= 38.1 mm wider. So if the offset stayed the same +45, the wheel goes 19 mm in, and 19 mm out with the 11 inch wide. So now you go with a +15 offset on a 9.5 wheel. That would move the wheel out 30 mm. 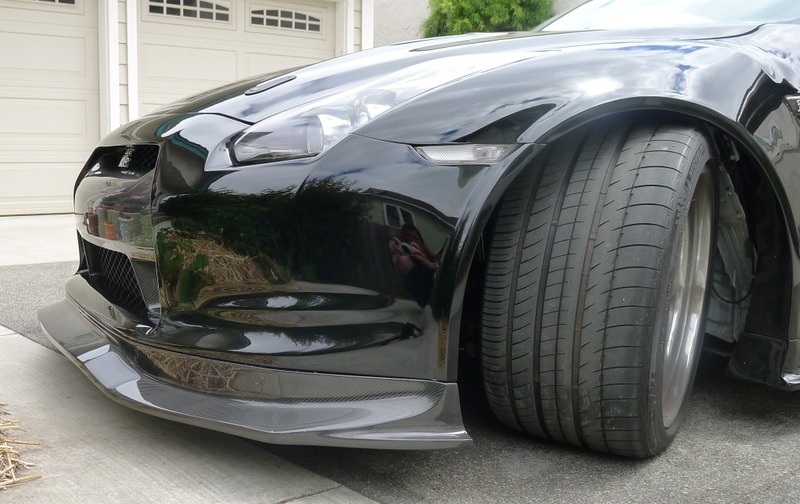 So if you took a 9.5 wheel, with a 15 offset, it would move out 30 mm, or stick out about 10 mm from the factory fender. The PWJDM fenders are +38 mm. A stock wheel, PWJDM fender would probably be in from the fender about 58mm(based on a 20mm being nearly flush). So, we take the +15 11.5 mm wheel . Add the +30, add the 19 mm- which puts it about 49 mm out. I think it would look fine, a spacer is probably pushing it. Gives you a little wiggle room. All of the following run-flat tires (RFT) are considered OEM for GT-R. Except for the Blizzaks and depending on year, package, and market, any of those tires can be mounted on the GT-R from the factory. It would be useful to have tire information broken down by criteria such as grip (dry, wet, winter), longevity, etc. The comparison data must be with everything else being equal such as camber and preferably using stock settings as the common reference point. 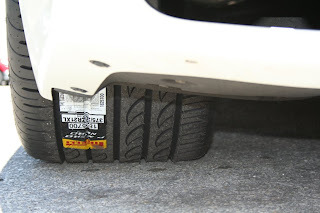 The intention is not to direct anyone to any specific tire, but at least to warn people to adjust their driving style according to the capabilities of the tire rather than having a false sense of security with the general belief that all models of brand X are better than brand Y under all conditions so caution can be thrown into the wind etc. We don`t have enough info on the newer Bridgestone RE070R R2 tire to see where it fits in with the rest. It's not clear where the Dunlop summer Maxx GT fit in nor do we have any info on the newer Bridgestone RE070R R2 tire. The Bridgestone RE070R being better than the Dunlop 600 is based on speculation that the comments in this thread refers to those models (not the A/S nor the newer Maxx GT). 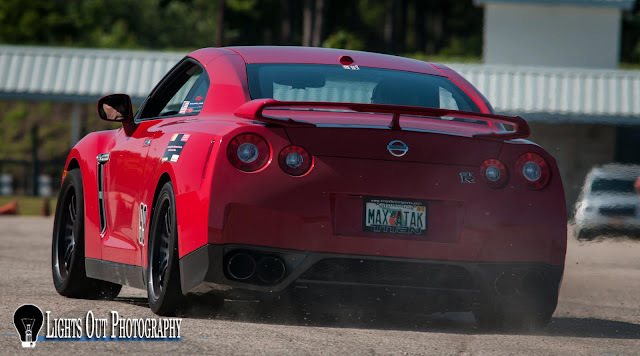 At least with the summer tires, it is known that under wet or cold conditions, the back end can snap oversteer if applying too much throttle deliberately. The Blizzaks have much better stopping ability. The Dunlop 7010 A/S tires are known to last longer than any of the summer performance tires while still performing quite well for street use and occasional track use. User feedback for this category is relevant because, despite its name, the Uniform Tire Quality Grade (UTQG) Rating is not applicable across tire manufacturers due to its original intention being botched. The above was garnered from feedback in various threads, but is open for debate and correction. I suppose it doesn't belong in this thread but it has evolved into a tire comparison thread nevertheless. 285 Dunlop tires front and rear aka "Square"
We call the front and rear tire matching as square, not staggered like the stock tires. Going square helps with understeer. Michelin PSS Tire Impressions in a 275 front, 295 rear combination. -The tires appear to wear slower than the Bridgestones, but It is not a huge difference. More track days are needed to say for sure. Also, I was running the 275's up front instead of 285's, and there is significantly more meat on the 285's, so I am sure you would get much better wear rates with the 285's up front. -Car feels more bouncy on bumpy areas of the track. This is a little unsettling at speed, but did not seem to actually affect the handling. -Tires seem like they are more sensitive to changes in pressure than the OEM's. After a full lapping session, the increase in tire pressure more noticeably affected tire grip. -The PSS's seemed like they got greasy more quickly than the bridgestones. Even with the cons I described above, I was able to turn in lap times that were as good, or even a few ticks quicker than when I was on the OEM Bridgestones. This is also after I had not been on a track in 6 months. Because the performance of these tires are virtually identical to the OEM tires, along with the fact that they last longer and are cheaper than OEM, I think the Michelin PSS are perfect for anyone who tracks their car, but does not have a separate set of wheels/tires for the track. The fact that these tires are worlds better than OEM for daily driving, but maintain almost equal performance at the track as OEM, speaks to how good of a job Michelin has done in developing this tire. Two thumbs up from me. As I run more track days, I will be able to comment more on the durability and longevity of these tires. 18" CCW C10's with Mickey Thompson's front = 51.5lbs, rear = 57lbs. 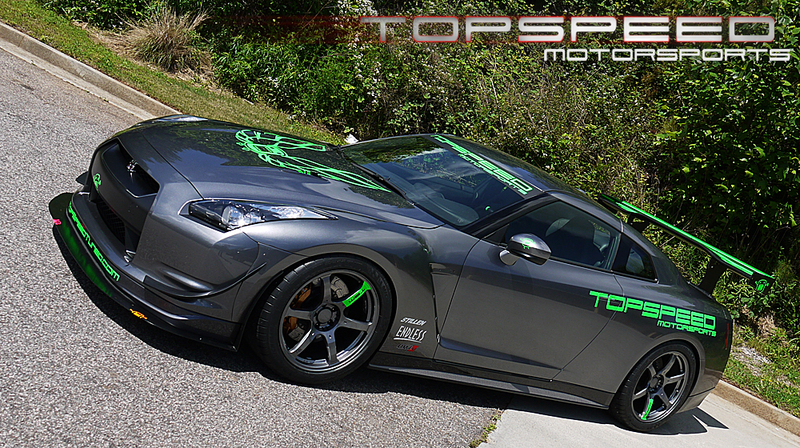 Ultimate Wheel Tire Thread for Nissan GTR on NAGROC. A lot of information in this post is information I posted in this thread. Changing tire and wheel combinations can give a lower profile for the vehicle, increase steering and cornering responses, and many other plus size tire benefits.